In just two days, Floyd “Money” Mayweather Jr puts his undefeated record on the line as he takes on Robert Guerrero in what is sure to be an explosive fight this weekend. Check out my interview with the self proclaimed “king of boxing”. Everyone wants to fight you in this sport no matter their weight class. Guys like Pacquiao, Alvarez, Sergio Martinez, and so on. Why do you think guys from lower and higher weight classes want to fight you? Does this help prove the case that you are the best pound for pound fighter in the world? For one, everyone wants a chunk of Mayweather money. Everyone knows that when you fight me, that is undoubtedly the biggest payday of any fighter’s career. And two, everyone wants to try to be the one guy to beat me, but we all know that isn’t happening. Forty-three have tried and 43 have failed. You’re a boxer but you’re also an “entertainer” with a brand. Why do you think that so few boxers can establish a brand like yourself? I am not just any fighter. I am a promoter. I am a businessman. I am an entrepreneur. I have my own style, and I am the best in the sport. All of that makes for an unbelievable brand. You are one of the most polarizing figures in sports. People either love you or they hate you. How do you deal with the “hate” portion from boxing and non boxing fans? I don’t pay attention to the critics and haters. If I let that get to me, I wouldn’t be doing this anymore. I have built my legacy with the support of my fans and followers. They have been there for me since the beginning and I appreciate that. As for the haters, they are still paying to watch me fight, so I have to thank them for that. What can we expect out of you from your new unexpected mega deal with Showtime/CBS? 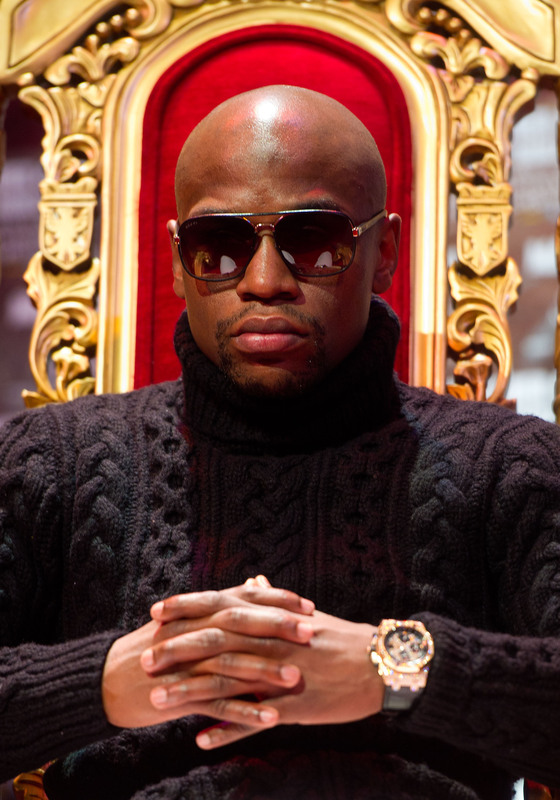 You can expect a whole new level of exposure for Floyd Mayweather and The Money Team. The programming they are rolling out for my May 4 fight is unbelievable and I am just really looking forward to being a part of the SHOWTIME/CBS Family. Last year you faced some obstacles which helped contribute to yet another long layoff from the sport of boxing. How do you still stay motivated and committed to the sport of boxing year in and year out? Boxing is what I do. It is my life and I have been doing it as long as I can remember. It is second nature to me, when I get in the gym, that is all there is…hard work and dedication no matter what is going on anywhere else. I am one hundred percent committed to preserving my legacy and being known as one of the best to ever lace up a pair of gloves. Some would say that Robert used borderline illegal bully tactics against Berto. What do you expect from Robert come May 4th? I expect a tough tough fight. Guerrero has wanted this fight for a long time and it was because of his determination, that he got it. He is a champion and is going for glory in the biggest payday of his career. He deserves the shot, but that is all it is going to be…a shot. You are now back training with your father, How does he being back impact life in the gym? My father taught me the foundation of my boxing skills, and we are really getting back to the basics in the gym. Hard work and dedication. Family is so important to me and it is great to have my dad, uncles and extended family day in and day out in the gym. What is your diet regimen like when you’re training? People are interested in how you maintain such great shape. I eat a lot of lean proteins, but I mostly stay in shape just by working it in the gym. I spend about 5 hours a day in the gym or running. That is how you stay in shape. When Floyd Mayweather’s career is all said and done, what legacy would you hope you’ve left behind? What would boxing be like without a Mayweather fight? I want to be known as the greatest of all time. Right now, I am the sport of boxing. People want to see me fight because there is no one else like me. There are some good up and comers, especially the fighters we have under the Mayweather Promotions banner, but the sport revolves around when I fight and luckily fans have a lot more Mayweather coming up. Your boxing skills are second to none and you are a master technician. What advice can you give to boxing hopefuls who are hoping to make a career out of prizefighting? This sport is all about hard work. If you don’t have it in you to work harder than you have ever worked in your life, than this sport isn’t for you. You have to leave it all in the gym every single day because there are hundreds of other guys doing that and then some. I wish you all of the best in the fight and I appreciate you taking the time to do the interview with us at Blended Entertainment. Is there anything that you’d like to say to your fans, the readers, and Robert in preparation for your May 4th battle? Thanks. Just tune in May 4, you will be happy that you did. This entry was posted in Interviews, Media, Sports and tagged Blended Entertainment, Boxing, Celeb Interviews, Entertainment, Espn, Floyd Mayweather Jr, Robert Guerrero. Bookmark the permalink. Pingback: Blended Entertainment | Mayweather vs Canelo: Who Will Remain Undefeated?